It was the end of a long day and week, and I was weary to the core. Wanting to curl up with a good book and a soft blanket, I glanced at the calendar and saw we were scheduled for an at-home-date night that evening. Feeling anything but attractive in my fleece pajamas and messy bun, I inwardly groaned at the thought of having to scramble to put together a fun night at home for Hubs. While I had missed quality alone time with him, our date nights had become stale and predictable. We usually ended up watching a movie and I was known for falling asleep half way through. I sat there for a moment, wondering how we could spice up our routine and reclaim a deeper level of intimacy between us with more creative date nights. It was there, in my end of the day grunge, where I finally figured out how we could rekindle the romance and fan the flame of true intimacy in our marriage. A date night jar would be the answer to our run-of-the mill dates and change how we connected with each other forever. 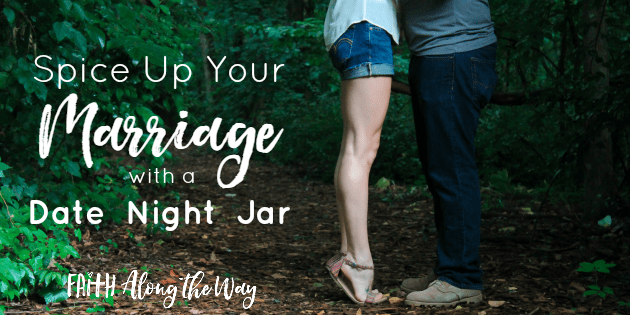 Here’s how to make a simple jar work for your marriage and help you spice things up in your relationship. Grab any jar or container and label it (or it just might end up with the kid’s crafts!). On index cards or paper, write down a few date nights you can do at home and a few ideas that you can do out on the town. Think WAY outside the box and get creative for ideas to help you have fun and reconnect. Sometimes the sillier the date, the more memorable it becomes. 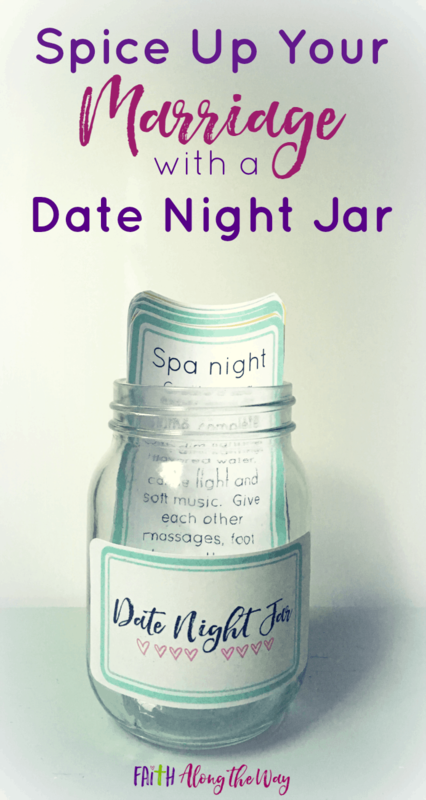 While I love being spontaneous and having adventures with Hubs, being parents makes spur of the moment date nights a little more difficult, thus insert the genius Date Night Jar! First, we grab our calendars and schedule our time together IN PEN! Outside of an emergency, nothing will stop us from going through with our date! Then one of us will pick an activity from the date jar and surprise the other on our scheduled time together. Taking turns coordinating and planning the date helps alleviate this burden for one spouse and gives an element of surprise (and who doesn’t love a surprise date!). As you’re brainstorming ideas for your date jar, challenge yourself to be creative and think outside the box. Try to think of new activities you haven’t done before to help expand your horizon as a couple. Grab a sleeping bag or a tent and enjoy snuggling under the stars. Make a campfire, roast s’mores and just enjoy being together. Create a spa experience at home; complete with dim lighting, flavored water, candle light and soft music. Give each other massages, foot rubs or other spa treatments. Create a theme to your taste test (chocolate, wine, cheese, etc…) and buy a variety of those products. Blind fold your spouse, and feed him/her a sampling of each product, having them guess which product they just tasted. Take a trip around the world without leaving your living room! Print pictures from different places around the world and hang them around your home. Have each portion of your evening represent a different country. For example, you could order take-out from an Italian restaurant for dinner, French pastries for dessert, enjoy a foreign film as entertainment and then create an imaginary trip to someplace tropical with a quick Google search. Create a romantic evening under the stars with a Christmas lights, a candle lit dinner, and dancing. Dress up and wear nice attire, pretending you’re at an exclusive restaurant for two. Surprise your spouse with a day or night filled with places that mean a lot to your relationship. You could recreate your first date, or visit places that have meaning to you or where milestone events happened. Have fun walking down memory lane! Play hooky for an entire day and have a grand adventure! Follow in the footsteps of this classic 80’s movie and rent a fun car for the day, go to a ball game, go to an expensive restaurant, buy a new outfit, or have fun concocting your own grand adventure together! Visit places you’ve never been but are tourist attractions right in your town or state. You’ll be amazed at the fun things you’ve missed in your own backyard! Recreate the 80’s with some favorite activities from this popular decade, including roller skating (if you dare! ), walking around the mall, eating fondue, and so much more! Print FREE date night cards! Do you want these dates in a form that are ready to print, cut and add to your date jar? Subscribe and grab the FREE Strong Family Project Printable Pack to help you strengthen your family with intentional activities and conversations. Plus, you’ll get the Strong Family Project Calendar, which will help you plan 65 days of intentional family building activities. What activities will be in your date night jar? How do you spice things up in your marriage? Thank you, Elaine! It makes date nights so much more fun! I am SO glad to know I’m not the only one! The Date Night Jar is a great solution for tired couples everywhere! Ooh, I love this idea. Hubby and I only do one out of the house date night but I’d like to do more in home date nights. Great idea. Glad I “stumbled upon” this article! Ha! I’m the same way and it’s glad to know I’m not alone! Awesome ideas! Love the jar also! My husband and I need to try this! It is so much fun and certainly spices things up! Thank you so much, Adelien! I truly appreciate it! Thanks, Leah! It sure makes it easy and entertaining to have date nights at home!